While finding a maternity wedding dress can seem difficult, gone are the days of hiding away pregnant brides in quiet, small weddings and civil ceremonies. Today's expectant mother can still have the wedding she always dreamed of, including a fabulous wedding dress that is designed to accentuate and flatter her newly developed curves. You may be able to find a plus size wedding dress or purchase a larger size dress that can be altered to fit, especially if you are getting married during the early weeks of your pregnancy. However, maternity wedding dresses are especially designed to complement or camouflage the growing stomach associated with mothers in the late second and third trimester. Most wedding boutiques offer a maternity section. Some shops may not actually keep maternity dresses in stock, but they can still order one for you through an in-store catalog. Like other wedding dresses, maternity ones are not usually cheap. Consider wearing a simple white or pastel maternity dress on your wedding day if you don't have the extra money for an actual maternity bridal gown for your wedding. The style you are most comfortable in for your wedding depends on whether you are early in your pregnancy or at the end of your pregnancy. Plenty of options are available for pregnant brides who want to look their best on their wedding day. If you plan your nuptials for the first trimester, you can usually fit into a standard wedding gown off the rack. Just purchase it one size bigger than you normally wear. If you're in between sizes, go up two sizes. 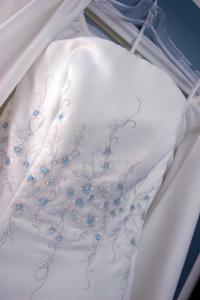 Traditionally, white wedding dresses were reserved for virgins. However, modern day etiquette is much more forgiving. Today's brides can find fashionable dresses in any color imaginable, including prints. From sequins and lace to velvet and floral prints, the bride's personal tastes set the tone for today's dream wedding. Maternity wedding dresses are sized similarly to what you would have purchased prior to pregnancy and, like a traditional wedding dress, you will probably need to have the dress altered for a custom fit. Expect to wait until a week or two before your wedding for your final fitting. As your pregnant body changes so rapidly, it's not possible to prepare for the big day too far in advance. With so many options for maternity wedding dresses, a pregnant bride-to-be doesn't have to worry about compromising her comfort to find the perfect dress. Many designers now create gowns specifically for expecting moms, making it a great time to have the perfect wedding.